A unique wooden Orthodox church has burned to the ground after being hit by an artillery shell in Gorlovka. The city is located in Ukraine’s Donetsk region – the site of ongoing bloody confrontations between Kiev's military and self-defense troops. Blagoveshchensky Cathedral was completely destroyed as the city came under heavy shelling on Thursday. 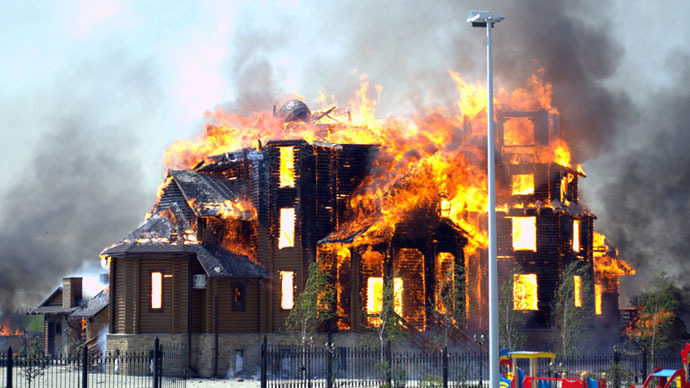 No one was injured in the attack, Gorlovka’s diocesan administration website reported. The 23-meter tall wooden structure was erected in 2008. It was initially built on a different site, and had been moved to its newest location. Building works on the church only finished in June. According to the Gorlovka diocese, it was a “unique” structure built entirely of pine wood, with no nails. Local children enjoyed the church playground, which was surrounded by flower beds, pines, and cypresses. They say lightning never strikes twice in the same place – but that rule did not apply to Blagoveshchensky Cathedral. The church survived a bombing just over one week ago, when shells landed on its territory, several meters away from the building and playground. Several other churches have sustained damage since the beginning of the bloody conflict in east Ukraine. Five clerics have been killed, according to Orthodox news website pravmir.ru. In late July, Gorlovka’s Orthodox Church facilities came under artillery attack from Kiev forces. 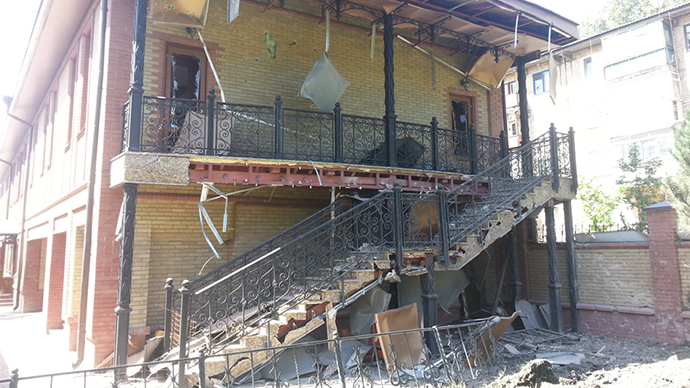 The shelling damaged the stairs and façade of Gorlovka’s diocesan administration building and broke several windows. Since ancient times, monasteries, churches, and other holy buildings have been “legally granted a status of asylum,” allowing such places to grant refuge to anyone who needs it, Vladimir Legoida, a spokesperson for the Russian Orthodox Church, said in a statement on Friday. “Unfortunately, neither church walls nor a ministry can grant protection from violence in the fratricidal confrontation in Ukraine,” he added. 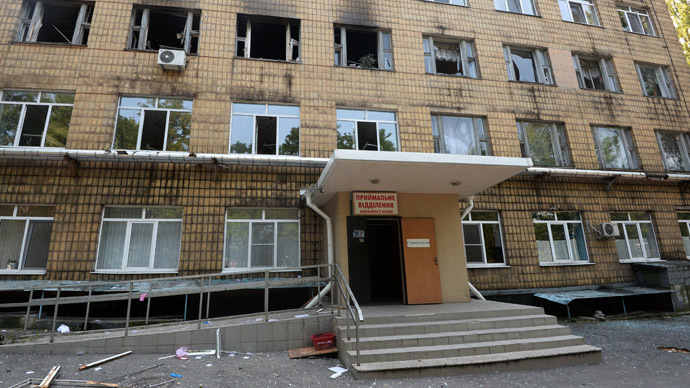 The shelling comes just one day after an Orthodox church suffered damage in Lugansk. 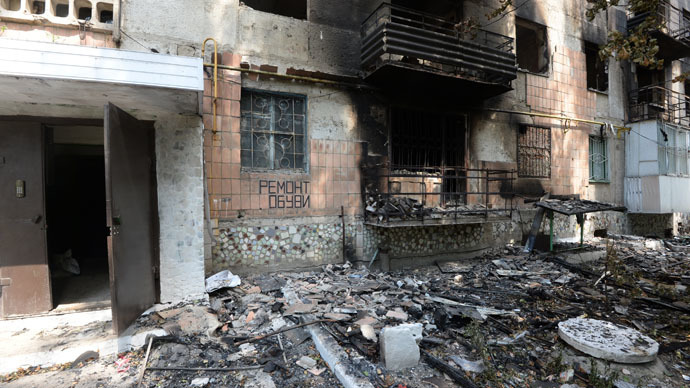 Five people from the same family were also killed in the city after the basement they were taking refuge in was shelled by Kiev government forces. The ongoing fighting in eastern Ukraine has already led to 118,000 people being internally displaced. The UN estimates that 740,000 others have fled to Russia. At least 1,367 people – both civilians and military troops – have been killed in the conflict, and 4,087 others have been wounded.